The pre-series verbal war has set the stage for an electrifying battle as India gear up to face a hostile South Africa in the first of a three-Test cricket series starting here tomorrow to not just prove themselves as worthy world number ones but also improve their poor record here. Despite standing on the threshhold of history, champion batsman Sachin Tendulkar seemed unfazed by the media attention and the anticipation around his 50th Test century. The year-end series away from home are quite interesting, given that it is a major holiday season in places like South Africa and Australia. Also, since the weather is quite bleak in the Northern Hemisphere, rivalries are always on the southern end of the globe, pretty far away from home. Indian pace spearhead Zaheer Khan is unlikely to play in the first cricket Test of the three-match series against South Africa starting here tomorrow, skipper Mahendra Singh Dhoni said today. "Zak has been our best bowler who has always led the bowling attack, whatever the conditions may be, whether it is a flat track or a seaming track," Dhoni said on the eve of the first Test. Australia are considering an all-pace bowling attack for the crucial third Ashes Test, but skipper Ricky Ponting admitted today he was still unsure of his best starting lineup. With less than 24 hours to go, Ponting said he wanted more time before naming his side for the Test at the WACA ground in Perth, which Australia must win to have a chance of regaining the Ashes. Former India captain Bishan Singh Bedi, who never misses an opportunity to take a dig at Muttiah Muralitharan and Harbhajan Singh, has once again lashed out at the two premier off-spinners. World Champion Viswanathan Anand was held to a draw by Michael Adams of England in the sixth and penultimate round but the Indian ace continued to hold joint lead at the London Chess Classic here. Koneru Humpy secured a much-needed draw against China's Ju Wenjun in the second game of the quarterfinals to enter the semifinals of the World Women's Chess Championship here. Humpy, who had made the semifinals in the last edition of the championship too, will face Yifan Hao of China in the next match. Yifan had ousted the Indian in 2008. Described as the "final frontier" by coach Gary Kirsten, world number two South Africa will challenge India's number one status like no other side has in more than a year when the series kicks off at the Super Sport Park here. Graeme Smith's men will look to exploit the Indian batsmen's well-known susceptibility to the rising deliveries on bouncy tracks here and the hosts have the necessary arsenal to do that -- the most potent of their weapons being world number one pacer Dale Steyn. The Indians go into the series well aware that they have won just one out of the 12 Tests they have played in the rainbow nation. Even if they didn't, the Proteas have not missed an opportunity to remind the visitors of the unflattering record ever since their arrival. In fact, the pre-series verbal sparring has added the ting of drama to the series which would make the contest even more interesting. When South African coach Corrie van Zyl stated that "record books don't lie" in an apparent reference to India's over the years poor showing here, India coach Gary Kirsten was quick to retort that things have changed in the past couple of years. Indeed, things do seem to have changed as the Indians have been on a dream run in the Test arena, winning seven of their last nine series, but most of them have come on the turning tracks of the sub-continent. The pace and bounce of South Africa would not be as easy to adapt considering the visitors go into the series without playing a single warm-up match. Add to this, the Indians also have to deal with a couple of injury worries in pace spearhead Zaheer Khan and S Sreesanth. Zaheer suffered a hamstring injury during the fourth ODI against New Zealand while Sreesanth hurt himself during training. Zaheer and Sreesanth are crucial to the team's chances given the conditions and it would be a massive jolt if they are ruled out. The conditions, in fact, would prove to be India's biggest challenge against a quality opposition but captain Dhoni said the his side is ready with a blend of youth and experience to record their first Test series win in South Africa. "It will be important for us to adapt to the conditions. Yet I believe we will be better prepared than before, because the guys have played here in the IPL and in the Champions League and it is not that foreign to them," Dhoni said. "We do not pay attention to what history says about what happened here in the past. We do not think too much about the statistics," he added. Dhoni's confidence does not seem misplaced considering the Indian batting line-up boasts of the iconic Sachin Tendulkar, who would be gunning for his historic 50th Test ton, the aggressive opening duo of Virender Sehwag and Gautam Gambhir and the ever-reliable middle-order mainstays Rahul Dravid and VVS Laxman. Suresh Raina provides the touch of youth and it would be interesting to see how the likes of Steyn, the lanky Morne Morkel and the exciting Wayne Parnell unsettle such a formidable combination. "I believe it is destiny. When it is destined to happen it will happen. I am not thinking too much about it. My focus is on preparation," Tendulkar said. Should he score a ton in the three-match Test series against South Africa beginning tomorrow, the iconic batsman from India would become the first man in the history of Test cricket to get to the coveted landmark. Tendulkar, however, preferred to focus on the match and not personal landmarks. "For me one thing is very important and that is to get acclimatized to local weather conditions," Tendulkar said as world number one India prepare to face second best South Africa. "Preparations have been spot on and the lengthy practice session has given us that opportunity (to get acclimatized). 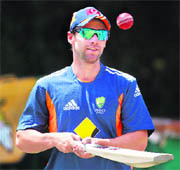 "We have had good net sessions under the guidance of coach Gary (Kirsten)," he said. Tendulkar pointed out that like India, South Africa will also have their task cut out as the series heralds the beginning of the season for the Proteas. "In South Africa, players and critics always talk about getting used to pace and bounce of wickets here. For them this is going to be the start of the season, so wickets are going to be a lot fresher," Tendulkar said. Talking about conditions in the Rainbow nation, Tendulkar said that one has to be extra careful in a high-altitude belt like Johannesburg. "While playing in Johannesburg you have to be extra careful. That is in high altitude area, so supply of oxygen is a bit of a problem," he said. Asked how difficult it is to get used to foreign conditions, Tendulkar explained: "When tour starts and we step on the cricket field for the first time we normally start running. While completing first lap one can easily feel that the body is not getting enough oxygen. "Once you get used to that kind of conditions then there is no problem." South African captain Graeme Smith, who had earlier described Tendulkar as a "great ambassador of the game", also hoped that the master batsman completed the landmark, though not against his team. "Sachin is a great player and a great ambassador for the game of cricket. I too wish that he gets his 50th Test hundred; not in this series but in the next series," Smith said. Given the distance, such series can also be quite trying, especially if you have come out worse off in the initial duels. The holiday season then bounces off you as you wallow in misery and uncertainty, the music and festivities seemingly as far away as home. Right now, no one wants to venture on which side will be partying harder, come Christmas. The three-Test series between South Africa and India could well be either, depending on how the visitors cope with the first match at Centurion. Even as South African coach Corrie van Zyl issues warnings to the Indian batsmen, it is not that department that will decide things, in favour or against. That is where the problem is. India’s bowling is already ringing alarm bells. Zaheer Khan will be very doubtful to walk into SuperSport Park tomorrow, and Sreesanth too is showing weaknesses Dhoni won’t need. Add to that Harbhajan’s pretty poor haul against a very limited New Zealand side, and the problem really comes out in the open. What wins Tests are 2 wickets, and somehow this Indian side will be challenged to get 20, three times over. Not that the South Africans are really rocking beyond Steyn and Morkel, or even just the former, but if he can send down 10 good overs in the morning, the rest of the work can’t be too hard. Bacher thinks this would be a drawn series, with neither side having enough firepower to dismiss the other. But somehow that won’t go down well with anyone. Also, one hopes this is about winning the series. Statistics like Sachin Tendulkar’s 50th Test century, which will b widely welcomed, shouldn’t be priority over a series win. Neither should the battle for the No. 1 spot on the ICC rankings. 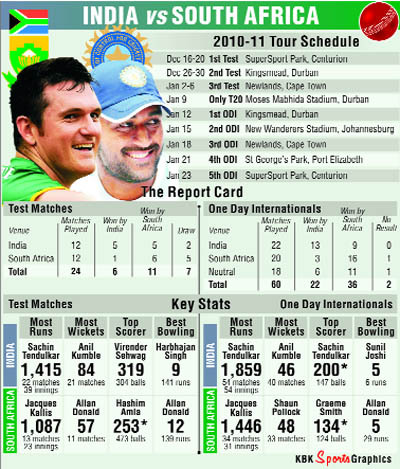 This should be a battle of the best, and a fascinating contest of superbly skilled cricketers. India would do well to come off with a series win. So would South Africa, for that matter. "He is always one bowler who has done really well. It is a blow, but at the same time we have to see the longer picture. We have to think about the World Cup also. "We are so close to the World Cup, and any injury to any of your best 11 players may have a bigger impact, so that's also a bit of a concern. Till we are 100 per cent sure about his fitness and injury, we won't risk playing him," he added. England arrived in Perth on Monday 1-0 up in the five-match series saying they knew their best 11, but Australia are still wavering over who to play on what is expected to be a lively pitch. Little-known left-arm spinner Michael Beer was picked for the Australian squad and looked likely to make his debut, but Ponting seemed to be having doubts at his pre-match press conference. "We haven't got a team yet, we've had a good look at the wicket this afternoon, it's changed a little bit since we've been here today so we want to just want to have a closer look at it again tomorrow before we finalise what our 11 will be," Ponting said. Ben Hilfenhaus and Ryan Harris had been expected to lead the Australian attack with either struggling Mitchell Johnson or or first Test hat-trick hero Peter Siddle as third seamer and Beer lining up as specialist spinner. But after talking to the WACA head groundsman, Ponting said he wanted to delay his final call. "It's different grass than there's been on the wicket before, so we've got a lot of things that we've got to think about yet before we finalise it," he said. "It's important to actually get a good feel of it tomorrow morning and just see how hard it is on the surface and if there's any moisture left in the surface before we make a decision." Leg-spinning all-rounder Steve Smith will bat at six, Ponting said, and the home side also have all-rounder and opening batsman Shane Watson as a seam bowling option. The last time Australia went into a Test without a specialist spinner was at the WACA in 2008, when they lost to India by 72 runs, but Ponting said his four seamers all had something to offer. However, his predecessor as Australian captain, Steve Waugh, said he wanted to see Beer play. "There is no point picking the guy if he's not going to play," Waugh said. "I called him (Murali) a javelin thrower. I can call him a shot-putter. People say that he has got 800 wickets. I would rather say that it's 800 run-outs!" said a sarcastic Bedi yesterday during a panel discussion at the RSD Summit on World Cricket, organised in the memory of late Raj Singh Dungarpur. Anand remained in the lead after Russian Vladimir Kramnik failed to bring home full points from a winning position against Magnus Carlsen of Norway in the 1,45,000 Euros prize money tournament being played on a round-robin basis. On a day of drawn games for the first time in the tournament, the status quo remained and Anand continued to share the lead with Carlsen and Luke McShane of England on 10 points in the Soccer like scoring system in use here that gives three points for a win and one for a draw. Kramnik and Hikaru Nakamura share the fourth spot now on nine points each while Adams is sole sixth on seven points, well ahead of compatriots David Howell, who has three points, and Nigel Short, who has just two points with his two draws so far. With just one round remaining, Anand faces arch-rival Kramnik, Carlsen is up against Short while McShane will take on Howell. The fact that Anand is playing white in the crucial last game gives the Indian ample chances to stay clear of the rest of the field in case he is able to register a victory. Playing black against Adams, Anand did not face any difficulties. It was a Sicilian Najdorf by the Indian ace who showed right intentions for a full-bloodied battle but Adams shied away from complicated lines and stuck to his basics out of a positional system. Anand equalised comfortably out of the opening and it looked as if he was pressing for an advantage in the endgame that ensued. However, an alert Adams kept black's forces at bay and once he had established an outpost for his knight in the middle of the board the outcome of a the game was a foregone conclusion. The peace was signed on move 54. Kramnik may not get a sound sleep in reflection of what he missed. The Russian could have been the sole leader and that many believed was just a notion once he got the winning position out a Nimzowitch defense that Carlsen employed with his black pieces.